When space is at a premium, maximising the functionality of every room in your house is important. So rather than having a guest bedroom that’s rarely used, make it a room you and your family can benefit from but that also doubles up as a comfortable place for your visitors to lay their heads. What you need is a day bed. They’re super versatile and are a cross between a chaise longue, a sofa and a bed allowing your room to be multi-purpose. The good news is that our charming, ever-popular Oliver Bed range now includes a gorgeous day bed and guest bed. A monochrome colour scheme is timeless, meaning your multi-purpose guest room is always fit for purpose and always on-trend. It’s classic and glamorous all in one go and a (non) colour palette you can’t go wrong with or get bored of. 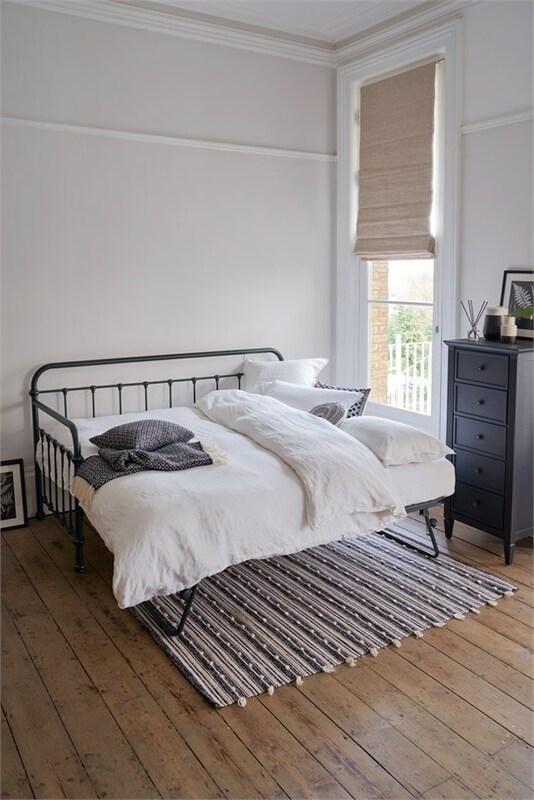 So, our Matt Black Oliver Day Bed and Guest Bed are welcome additions to the Oliver family, proving themselves as functional, versatile and the perfect centre piece for your monochrome styling. Monochrome is an easy theme to echo throughout the whole room and is accommodating of texture and pattern, so we’ve layered in our beautifully soft and intricately designed Diamond Monochrome Wool Throw and Cushions, which stand out against the cool crispness of our Camille White 100% linen Bed Linen. It’s the perfect combination. Our Oliver Day Bed and Guest Bed connect together quickly, easily and at the same height, which is an important point to note as many day beds work at different heights, with the guest pull out section resting at a lower level. Our Day and Guest Beds are sold separately – each are standard singles and, once put together, create a super king and a super bed for your guests. Standing tall is our Verona Black Tall 5 Drawer Chest, which is crafted from oak and inspired by the Swedish Gustavian style, featuring elegant fluting detail. If monochrome isn’t your thing, our Verona Drawers are available to customise from a choice of 11 paint colours and either a Dark Oak or Natural Oak top. 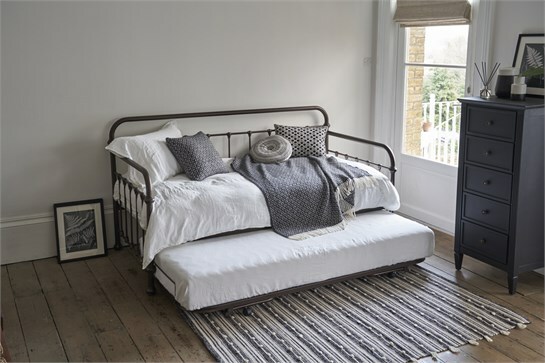 And talking of colour options, our Oliver Day Bed and Guest Bed are available in Warm White.